Friday August 24, 2018 - Former Mungiki leader, Maina Njenga, has joined NASA leader, Raila Odinga, in pushing for a Constitutional referendum to create a position of powerful Prime Minister and a weak President. Speaking yesterday, Njenga said he will use his new outfit, Amani Sasa Foundation, to drum up support for the creation of a PM’s post and two Deputies. “The changes include re-introduction of the Prime Minister’s seat with two Deputies,” said Njenga. 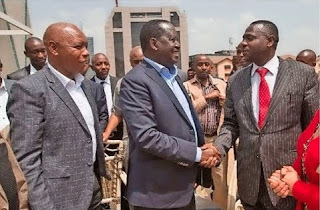 Similar sentiments were echoed by Murang’a Senator, Irungu Kang’ata, who said that change is needed to treat ethnic divisions in the country. “Countries like Lebanon and Ireland expanded the executive,” Kang’ata said.